I would say that these tips are important to me because they make the relationship feel fresh and have new meaning. We’ve been through a lot of changes lately. I started to worry that we might loose ‘us' because most our conversations centre around work… but now I have some love tools and I am really appreciative! I loved that the author was so open with his personal relationship challenges, it really brought the concepts to life. Also Marko has a GREAT accent, that is so engaging. The author included a link to a dedicated show notes page. 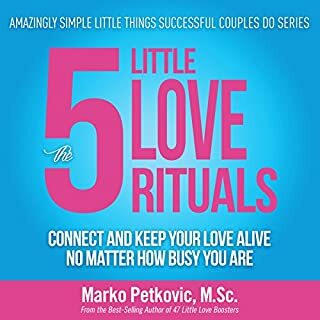 It contains downloadable cheat sheets with beautifully illustrated suggestions how to start putting daily love rituals into practice right away. Well worth my time. Recommended.